Belle On Trend: All Eyelet All Over! Eyelet, noun: a small hole, usually round and finished along the edge, as in cloth or leather for the passage of a lace or cord or as in embroidery for ornamental effect; a lightweight fabric pierced by small holes finished with stitching and often laid out in flowerlike designs (courtesy of Dictionary.com). 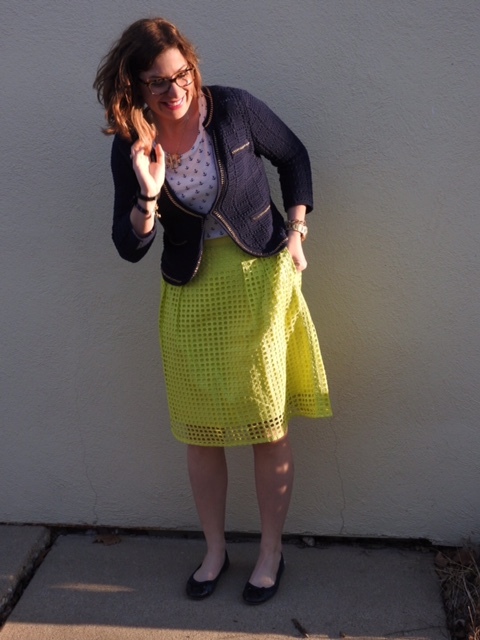 There is nothing more appropriate to officially welcome spring than eyelet! You may have seen the material before and didn't realize that it was eyelet. I am constantly learning new terms for patterns (buffalo plaid, gingham, houndstooth, and my bestie and fellow fashionista, Courtney, just taught me damask!). Eyelet comes in skirts, shirts, dresses and even shoes! Below are some pieces to get you spring-ready! One of my all time favorite outfits: remember this? An updated look for spring! My skirt: old Loft, but similar here. 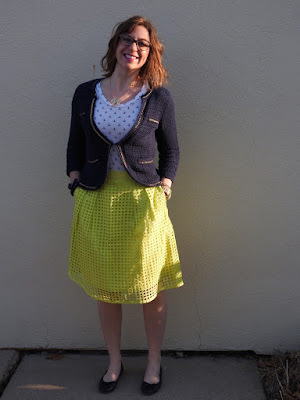 I'm loving these eyelet skirts: here, here and here. Cooper loves his Auntie. Just wait until BBC gets here... I can't wait to spoil him! Adoring these eyelet long-sleeved options: here and here. 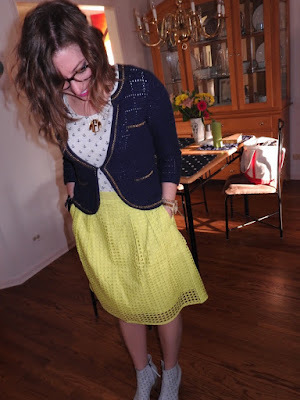 The best thing about eyelet pieces is how lightweight and airy they are. Even a long-sleeved eyelet shirt will be comfortable in warmer temperatures because of all the holes. Eyelet peplum from Banana Republic: here. Warning: this shirt is fabulous, but runs REALLY large. This is an XS on me; I am not an XS, haha. The shirt is meant to be flowy, so if you are someone who prefers a more body-hugging silhouette, this might not be the eyelet top for you. 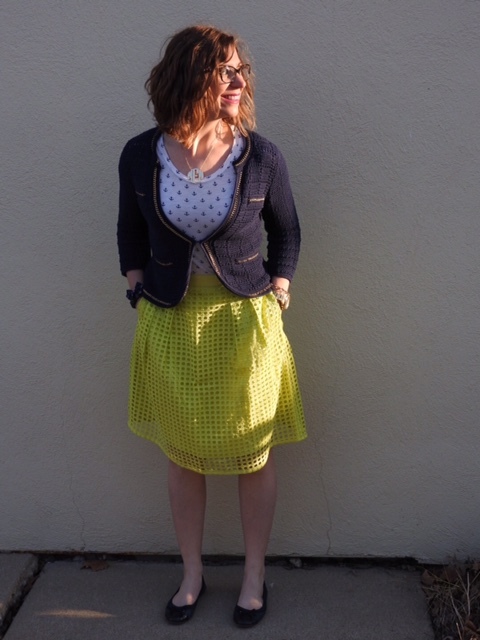 Loving these eyelet tops: here, here (for under $10! OMG! ), here, here (the yellow and back! Beauty! ), here with ruffles, and here. Eyelet dresses: here, here, here, here, here, here and my personal fave, here, which I am planning to try on in Florida! Vintage ND shirt (from the time that Cavanaugh was a men's dorm at Notre Dame) thanks to my sis-in-law and fellow Smick Chick, Lidija. Eyelet shorts: here, here and here. There are even eyelet SHOES! Believe it or not! Pretty shoe pics courtesy of Mike's artistic ability! There is not a better heel out there than the Toms peep toe booties. I can stand in them all day-- without any pain-- I hit 10,000 steps on my FitBit in these bad boys without any problems. 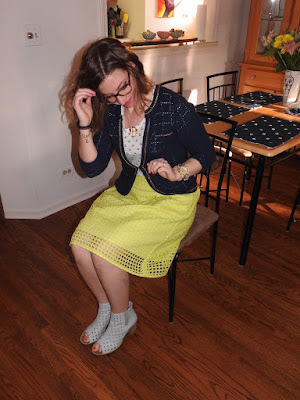 I love pairing these eyelet booties with shorts, skirts and dresses! I also love them with a rolled up, cropped boyfriend jean! The fringe on these is amazing. These are also a nice alternative. How will you rock your eyelet this season?